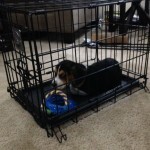 In our first episode of the Perfect Puppy Training Series we talk about crate training. Having a dog that’s crate trained can be very valuable, it helps with everything from house breaking and preventing unwanted chewing and destruction in your house to giving your dog a safe place to go when guests or maintenance workers come over. We recommend starting to crate train your puppy from the first day you bring her home. In this video we talk more about why we crate train, the different types of crates and their pros and cons, how to properly size your crate for your puppy or dog and a few do and don’t when it comes to introducing your new puppy to a crate. Our goal is to have our puppies associate the crate with a positive experience and to ultimately enjoy spending time in there. We don’t recommend using the crate as a punishment as this could create a negative association and cause issues later on down the line. Check out Episode #1 in our Perfect Puppy Training Series below.